A New Year holds promise of new possibilities, new endeavors and the chance to change our perspective. Regardless of whether you felt that last year was a great year for you or a not-so-great one, it’s time to leave 2017 in the dust! We at Buyer’s Choice are racing into 2018 with high hopes for the future. 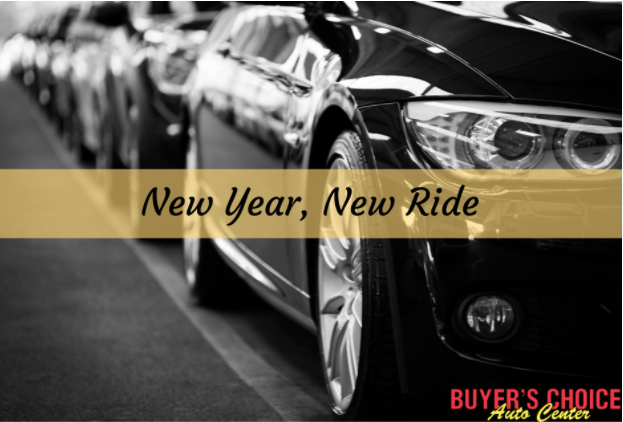 Right now is a great time to buy a car and start the year fresh without the problems and worries of your old vehicle. If you want to get 2018 started off on the right foot (or should we say wheel) Buyer’s Choice is where you want to be. We know that cars are already a serious financial obligation. We don’t charge you extra “dealer fees” when you shop with us. It saves you money, saves everyone time, and shows you that honesty and integrity are important to us. So you’ve been turned down from dealerships because you can’t get the credit approval you need? Come talk to us! We work with you to find a vehicle that you want with a monthly payment that’s feasible. Buyer’s Choice has many loyal and returning customers. Both Doug and Larry receive praise in our reviews consistently for their friendly demeanor and helpful attitudes. Our staff cares about putting you in the right vehicle, not just any vehicle. While we may not have every car on the lot, we can get just about any car in as little as 3 days. Our full inventory is on our website, so you can easily search for your dream car. If you can’t find it, you can make a request to us all from the comfort of your own home. Think it’s time to make your move on buying a car? Give us a call at 843-225-7044 or visit our website.